Lighttpd have an access log, but it's disabled by default. The log will be written in the defined file. Every week, the file will be saved as "access.log.2.gz" and a new "access.log" file will be created. address of remote-host adress of the server user timestamp "request" status code bytes sent "Referer adress" "User-Agent"
1?.6?.1?.1? 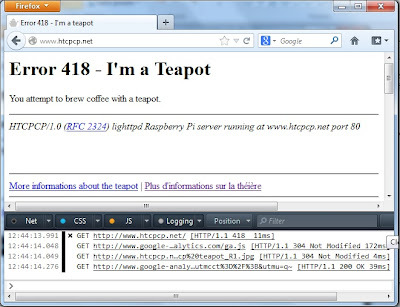 www.htcpcp.net - 23/Jan/2013:07:13:56 +0000 "GET / HTTP/1.1" 200 1371 "http://www.error418.fr/" "Mozilla/4.0 (compatible; MSIE 7.0; Windows NT 6.0)"
When I decided to check of my server log, I didn't thought to find something interesting in it. But reading this log was much more exciting than I thought, making me discover a universe populated by Agents Robots, Nerds and Pirates who will the topic of future posts. I have found a simple a way to correct the lack of 418 return code. 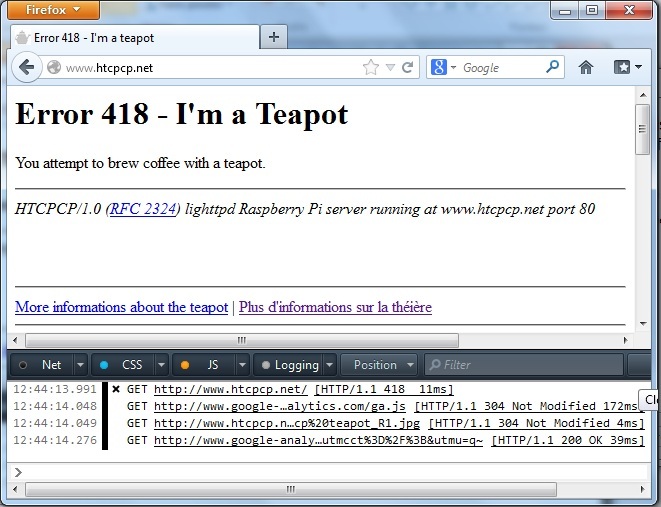 There are php commands to control the return code in the header. "sudo apt-get install lighttpd php5-cgi"
"sudo lighty-enable-mod fastcgi" "sudo lighty-enable-mod fastcgi-php"
After that I have renamed my index.html for index.php and then I have added this PHP code to my page.